Welcome to my blog. On New Years Eve 2016 I decided to photograph a plant each day of the year as an inspirational record of the seasons. I love looking for and ultimately discovering flowers and plants to inspire me. It brightens up my day when I find a vibrant or colourful flower in the deepest darkest depths of winter. Skeletons of leaves and flowers make me think of delicate vintage lace. These natural beauties always inspire ideas for paintings and patterns of gilded watercolour and bejewelled wonder. Finding the first daffodil is the first sign of sunnier times ahead. Blossoms begin to bloom and as the daylight hours grow so do the multitude of colours. Summer blooms stops me in my tracks to photograph all those rich flowers basking in all their radiant glory. These are the days where my camera is full to the brim with excitement. Autumn offers deep, rich and warm colours. Singular fronds print the pavement and en masse they create fallen patterns beneath the majestic trees above. This blog is a source for seasonal reflection and the beginnings of an online sketch book. I hope you get as much joy out perusing it as I have in it's creation. I would recommend visiting this tropical escapism. The cacti house is incredible! I love it when the garden is fresh with rain water. All the evergreen plants In this photo make for a fantastic lush background. In this photo I particularly like the light that twinkles through the trees and the droplets in the foreground seem to be shining brightly like precious jewels. It turns out that you can spray most folliage with metalic paint and use it to make festive flower arrangements. 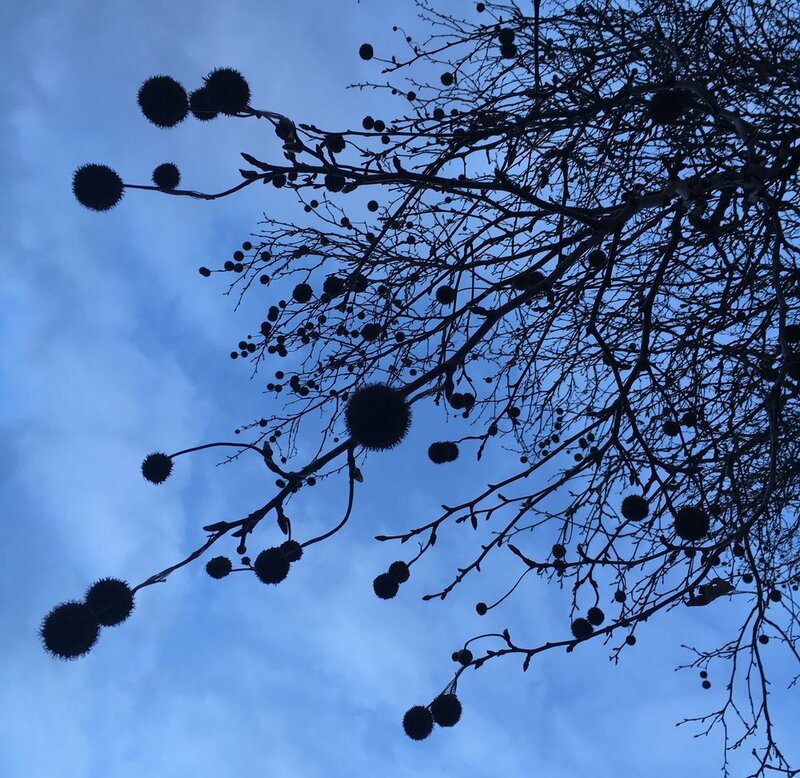 The London Plain trees have there own natural Christmas baubles at Christmas. My Hyasinth bulbs are blue! I hoped they would be. They were not labelled according to colour. I’m happy as blue Hyasinths are my favourite. Here’s a dried orange Christmas tree decoration. You can also just slice and dry oranges too. Natural structures lend themselves so well to design. These candelabra simply look great sprayed gold or silver as part of a festive flower arrangement. In textiles they make me think of weave and knit structures. They are fantastic for life drawing observations too. These sketches can then be used to create a textured element within a printed design. Here’s our Hydrangia in neutral tones created using the grey sky as a backdrop and the brown, winter flowers as a silluette. We went to Borough Market to buy some cheese for Christmas. The Christmas tree at the market was decorated with dried oranges and pine cones. Here’s our neighbours bamboo taken looking up at the sky. I really like the light that shines through the leaves. I found some great metallic colours and pearly droplets. I’ve been enjoying Christmas shopping lately. I’m really pleased with this Skimmia Japonica that I found for my brother. I’m quite proud of our kitchen plant collection. My Hyacinths are loving this time of year all huddled up in their pot. This succulent looks like a star fish. James’s Alocacia looking pretty cool. ...and some little money plants. The money tree my parents gave us is looking beautiful these days. James put lights on the Cheese Plant. James bought a Christmas tree and we decorated it together. I absolutely love the smell. This is one of my favourite things at this time of year.